It has been something of an annus horribilis where health has been concerned. ‘You’re lactose intolerant,’ the doctor announced matter-of-factly after squinting at my test results. ‘So what does that mean,’ I asked, hoping for a medical explanation or, at the very least, some guidance for my culinary future. ‘You need to avoid dairy,’ my not-entirely-helpful physician concluded. And that was that. She’d referred me to an Australian dietitian who asked me to describe what I ate in a typical day. Cereal. Granola Bars. Spinach-Phyllo Triangles. She laughed at my unvaried diet and I almost asked her to be my friend, because who doesn’t like a friend with an excellent sense of humor. But then she said: ‘I think you should avoid gluten.’ And I rescinded my unspoken friend request. Because I couldn’t be friends with anyone who wanted to separate me from muffins and scones and cake. I met another nutritionist-friend for green tea. ‘You need to give up gluten’, she told me, in addition to dispatching me to the Superstore to pick up unsweetened almond milk and protein powder for my smoothies and Lara bars for my snack. But I’m new to this protein powder business so I bought the ‘improved taste’ package and made a smoothie. It tasted like sludge. ‘What is IN this,’ the professor sputtered, having only recently adjusted to my ‘spinach’ smoothies. I held up the package of ‘improved taste’ powder. It had been rather pricey. I was going to have to finish it. I bit into a Cherry Lara Bar. It tasted like earthy, unsweetened dried cherries with a side of ‘something else’. I tried to get the boys excited about the ‘cherry bars’. They took a bite. ‘Um, no thanks,’ and handed it back. I’d bought a large box. I was going to have to eat them. I made a [decaf!] latte with my unsweetened almond milk. It tasted like coffee mixed with dirt water. Or so I imagine, since I’ve never actually mixed my coffee with dirt water. Though I’m sure my boys have. 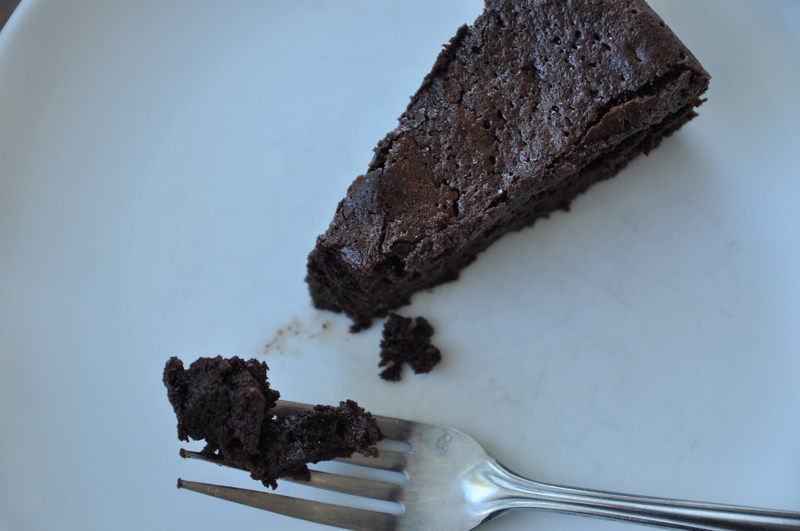 For two months I interspersed my dairyless, sludge-dirt existence with my usual diet of baked goods. 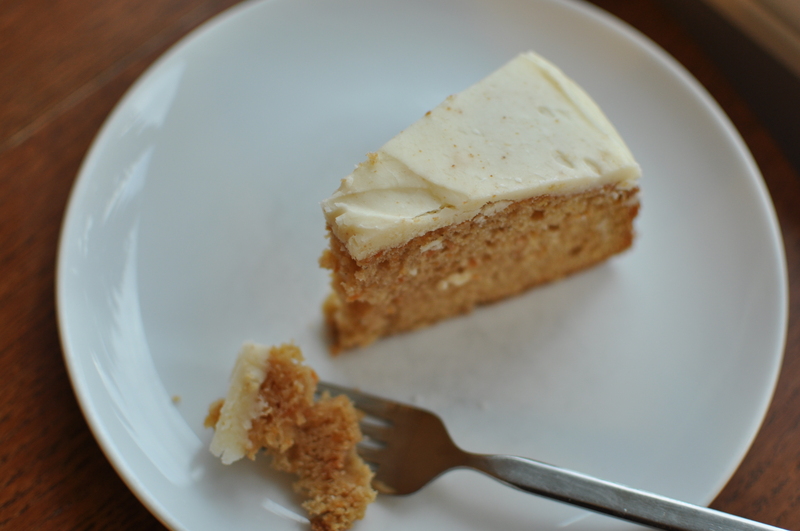 Namely this gem of a cake, which I made (far too many times) with pureed sweet potato instead of pumpkin. And then I saw a naturopath. ‘You need to give up gluten,’ she chorused, before sending me away with a bottle of licorice extract. Even though the rooster had already crowed, it took one more conversation with an acquaintance who’d been living gluten-free for ten years to convince me to try it. ‘But I love me a crumb,’ I despaired uneloquently like a petulant child, unwilling to imagine a world without all-purpose or whole wheat pastry flour. So now, in addition to dirt lattes, sludge smoothies, and flavored date-nut bars, I eat soup. At last count, I’ve eaten soup at least once a day (sometimes twice) for ten days. Straight. Curried lentil soup: possibly one of the best soups I’ve had, though none of the Johnson boys agreed. ‘What is that taste?’ the professor winced. ‘Cardamom?’ I guessed, since all the other flavors were ones I typically used. ‘Yeah, I don’t like cardamom,’ he decided, which means I ate a lot of lentils. A LOT. Squash-leek soup: also very good, and tolerated by most of the Johnson boys. 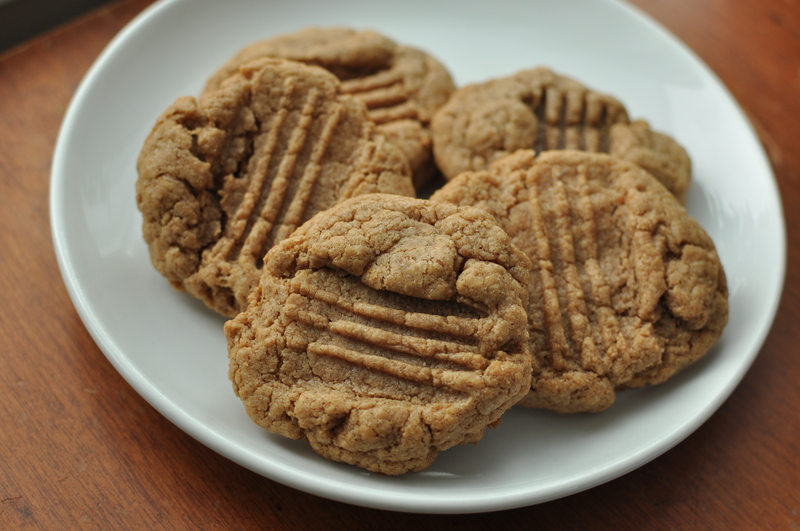 Flourless peanut butter cookies. They’re not great, but they’re not awful. Though I can’t imagine making three batches a week is going to do me any favors. Oh my dear friend. I ache for you! This is indeed tragic news. what’s the verdict so far? I have been unofficially told the same thing (to go gluten-free), but can’t help but think it is so ‘trendy’. Sure we’d all be healthier without wheat, etc, but is it really a health cure? Please keep me posted. I haven’t mustered the courage to try, mostly since the rest of the family wouldn’t do it with me, and that doesn’t seem realistic! Berta, I know, right?! Rachel, I will keep you posted – I’m inclined to think like you on this one. J, would you like some lentils with those tears? Yes Tan, it is fairly limiting. Hence the mostly-soup diet! I’m going to try it for a month or so and then I will see if moderation does the trick. Because gluten-free chocolate chip cookies are akin to torture.